The former Communications Disorders car park will be unavailable from 11 February and pedestrian access through the site will be closed from 18 February. In preparation for the land being sold, buildings on the site have been sold and will be removed between 18 February and late March. Buildings being moved will be loaded onto trucks during the day and removed from the site outside normal working hours. Parking is available at UC’s other car parks as usual. If you park on Montana Avenue, please take care to follow signage and not block driveways or access routes as these will be used to clear the site. You will have noticed Kirkwood Village is now closed and surrounded by temporary fencing. This might be affecting your favourite route to the RecCentre, but don’t let that be an excuse keeping you from being fit, healthy and well for the summer months. 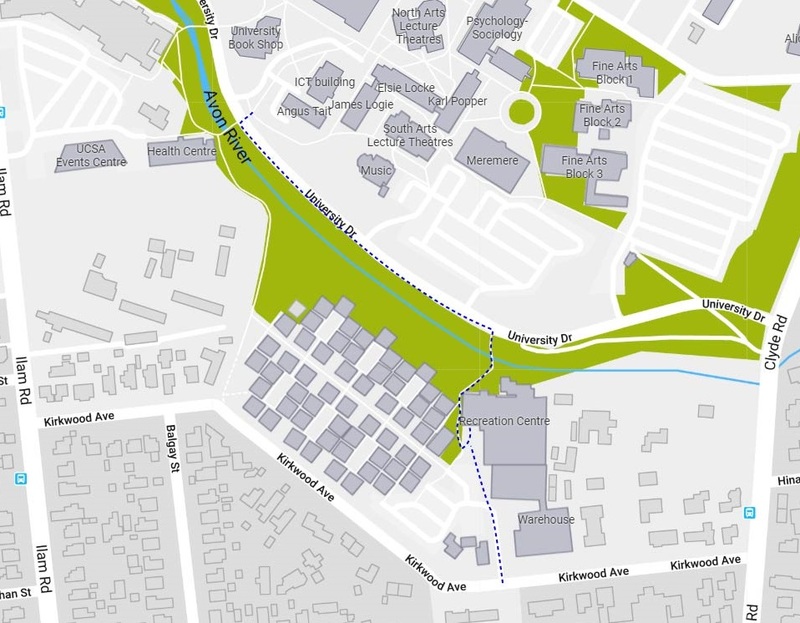 The RecCentre can be easily accessed from the footbridge on University Drive, by the Law car park and Kirkwood Avenue (see the map below). Be careful of others around the RecCentre as some of these footpaths can be narrow. If you are riding your bike or skateboard it is recommended you walk from the footbridge into the RecCentre. The RecCentre can no longer be accessed from the footbridge on University Drive by the UC Health Centre.